I can see that some of the Halloween Night Horror episodes are cheesy and are even crappy for some of them (Suda Akari is my face so far maybe cuz I like Hannibal). My idea of an Episode is maybe a disturbingly obsessed WOTA with a love of Kidnapping and 'memento collecting'. The Hooded man is Actually Gizzur on Crack. And he wanted 'models' of his next line of Jewelry to be the AKB girls. In this, the main girl (Sae first came to mind when I thought of this) is having trouble sleeping at night because she's sleepwalking. Her roommate comes home and finds her trying to kill herself by cutting her wrist and stops her. She takes some medicine to prevent this from happening again, along with locking up the drawer with the knives, but she sleepwalks again and tries to kill herself by jumping off the roof. Due to these events, she becomes terrified of sleeping and develops insomnia. After three days of no sleep, she's finally reached her breaking point. She unknowingly falls asleep and prepares to shoot herself. She ends up in the hospital, in a coma, until her roommate comes to visit her and sees her awake, walking to the balcony and falling off, dying. So.......yeah, this is probably the darkest thing I've ever thought of. Please forgive me, Sae-oshis. The story revolves around Mayu's sudden death, murder to be exact. Her girlfriend, Jurina was one of the prime suspects. 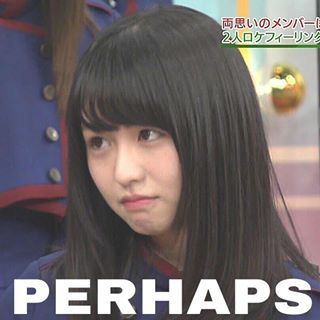 However, no evidence was found and Jurina was proven innocent. After 6 months of no progress on the investigation, the police decided to close the case. A year later, Mayu's family suddenly found a CCTV footage from a restaurant, an hour before Mayu's death. In the footage, she was seen having a fight with Rena, Jurina's best friend turned girlfriend. Because of that, Jurina started to secretly investigate her current girlfriend and found out that Rena was indeed the killer. The catch is, Rena wasn't all alone. The other one who killed Mayu was Center, Jurina's other personality. Page created in 0.346 seconds with 14 queries.